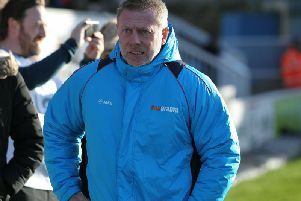 COLIN Cooper admits he had no hesitation in plunging Michael Duckworth into the Hartlepool United starting line-up – and that is where he expects him to stay. The 21-year-old signed a month-to-month deal at Victoria Park last Thursday following an impressive trial period. And by Saturday afternoon he was lining up for his Football League debut against Fleetwood Town. Pools were beaten 1-0 by The Cod Army but Duckworth emerged as man-of-the-match following an energetic display at right-back. And Cooper today told SportMail: “Michael did what I expected him to do, without nerves. “He’s come from non-league football with Bradford Park Avenue and has only trained with us for a month. “But he showed on Saturday why I’ve been desperate to get something done with him in that time. “It’s not easy with financial fair play, but I’ve been encouraged from when I went to see the chief executive and chairman and said I would like to give this lad an opportunity. “As soon as the forms were signed then I wanted to get him in the team. “He does what I like in a footballer but he will also learn and get better from it. And Cooper sees no reason why Duckworth will not remain at the club – and in the first-team – for many years to come. “Michael looks exactly what his ex-manager told me he would be – a player who is too good not to be playing league football,” he went on. “He has shown me that he’s more than capable of coping what we throw at him. “Can he now impose himself in league football? That’s the challenge for him.